A July 24 demonstration against social media arrests in Lebanon. Photo by Hasan Shaaban, used with permission. Lebanese security agencies are ramping up the interrogation and censorship of online activists and journalists over social media posts, and sparking renewed debate over the limits to freedom of speech in the country. 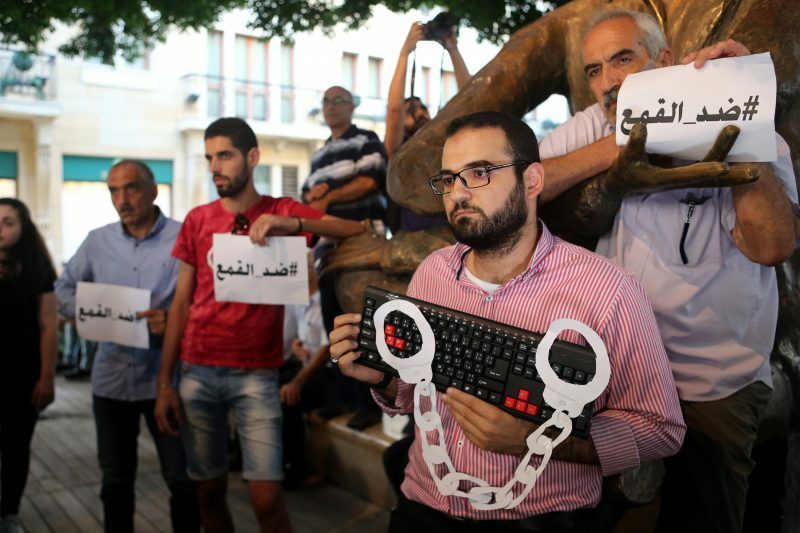 Over the past few weeks, at least 10 activists were interrogated by Lebanese security agencies, eight of them by the Internal Security Forces’ Cybercrimes Bureau, over Facebook and Twitter posts. This compares to 18 people summoned by the agency in the six years between 2010-2016, according to research  by Social Media Exchange, a local NGO that works on internet policy. Though Lebanese law contains protections for freedom of expression and freedom of the press, insulting the president, the Lebanese Army, religion or the flag can result in up to a three-year prison sentence and heavy fines. Slander, libel and defamation laws have also increasingly been used by politicians and representatives of big businesses to question and prosecute activists and crack down on critical online speech. In most of these cases, the subject matter of the offending posts included calls for online activism, jokes or sarcastic comments about religious figures, and alleged criticism of the president and other politicians. On July 17, activist and blogger Imad Bazzi was called in for interrogation by the bureau, over a post calling for online activism against the controversial Lancaster Eden Bay resort. The seaside developments project has been heavily criticized over the legally dubious manner of its construction and subsequent opening, on what is by Lebanese law designated as public land. After initially postponing the interrogation due to surgery, Bazzi was called in once again  and attended his interrogation on July 27, refusing to sign a pledge committing not to criticize Eden Bay again, he told local news channel LBCI. Maj. Gen. Albert Khoury, the head of the Cybercrimes Bureau, told LBCI that Bazzi had been summoned based on a complaint filed by representatives of the resort, who alleged he had caused indirect damages to its reputation. Bazzi had suggested to his followers to post negative online reviews of the resort, in what Ayman Muhana, the director fo SKeyes, described as legitimate online activism. Journalist Mohammad Awwad was detained and questioned by General Security on July 20 over Facebook posts reported  to be critical of politicians and religious leaders. The Daily Star quoted Awwad as saying the officials included President Michel Aoun, the head of the Higher Shiite Council, the Sunni Grand Mufti and the Maronite patriarch. Awwad claimed that he had not addressed any of these officials in his recent posts, and said he was not informed of which posts exactly he was interrogated for, nor was he told who had filed the complaint against him. “Social media websites are the only platforms of freedom available to us. If they are that bothered by it, let them shut down the internet in the whole country,” he was quoted as saying. Aboushy told  SKeyes he was beaten upon his arrest and held for two days, only being released after signing a pledge not to criticize Aoun or Bassil again. The pledges interrogators at the Cybercrimes Bureau often try to get activists to sign are widely reported to have no legal basis. The Internal Security Forces’ Cybercrimes Bureau is the avenue through which most of these interrogations take place. Established in 2006 to strengthen the Lebanese state’s online security capabilities in the digital age, the Cybercrimes Bureau has caused controversy over its apparent arbitrary enforcement of aged laws dating back to the 1943 Penal Code. Many activists are being interrogated on the basis of articles 473 and 474 of that legal text, which say that anyone who ”disparages” the name of god or religion can be imprisoned for between one month and several years. A March 2016 report  by a Lebanese NGO focused on freedom of expression, the Samir Kassir Foundation’s Center for Media and Cultural Freedom (SKeyes), said the agency’s conduct often amounts to censorship of free speech. While Lebanon does not have explicit, stand-alone anti-cybercrime or anti-terrorism laws, the anti-defamation articles fulfill a similar purpose of both directly targeting activists and dissidents and, by using these cases to set an example, intimidating online journalists, bloggers and Internet users from speaking about certain subjects, thus paving the way for self-censorship and the chilling of speech. SKeyes estimates that, over the past two years, arrests targeting activists and journalists increased threefold from 10 per year to 30. Rights groups say the bureau’s censorship role has been particularly evident in recent weeks, with a flurry of activists being detained, forced to delete posts and sign pledges to refrain from publishing “slanderous” content again and, in one case, being prohibited from making any online statements for a month. Jad Shahrour of the Center for the Defense of Media Freedoms in Beirut told  Aljazeera that crackdowns on freedom of expression have been on the rise since Aoun’s term began in late 2016 and that 60 percent of activists interrogated by authorities were summoned following complaints from President Aoun and the FPM party, which has the largest bloc in parliament. Online activist and comedian Charbel Khoury was briefly detained on July 20 over a sarcastic joke on the medical miracles performed by St. Charbel, a religious figure revered by many in Lebanon. The activist was released after signing a pledge not to address religion in his posts and deactivate his Facebook account for a month. The complaint against Khoury was filed by a religious organization, the Catholic Media Center, The Daily Star reported . لم يكن ينقص التحقيق معي في مكتب مكافحة جرائم المعلوماتية إلا كاهناً ومذبحاً. أخذ الضباط في قوى الأمن الداخلي الذين حققوا معي على عاتقهم محاولة إعادتي إلى طريق الخلاص المسيحي. من أول الأسئلة التي طُرحت عليّ في التحقيق الذي استمرّ خمس ساعات، هو إذا كنت «معمدّة» (حاصلة على رتبة العماد)، إذ يبدو برأيهم أن أحداً لا يكتب نكتةً في موضوع ديني، إلا إذا كانت تسكنه «أرواحٌ شريرة». Only a priest and an alter were missing from my interrogation at the Cybercrimes Bureau. The ISF officers who interrogated me troubled themselves and tried to return me to the Christian path of salvation. During the interrogation that lasted five hours, among the first questions were whether I was ”baptised”, as according to them no one writes a joke about religion unless they are inhabited by ”devil spirits”. “I was brought up in a family where we used to talk about how all the Arab writers who were being oppressed would to come to Beirut for asylum,” Mariam Majdoline, one of the organizers, was quoted as saying by The Daily Star.